You can find more information about OpenGL here. You can find more information about GLUT here. Many Operating Systems come with preinstalled GLUT, but if yours does not have one you can easily find it using Google. Windows binaries can be downloaded from www.xmission.com. The GLUT FPC units information is here OpenGL. The Lazarus Component Library can be used with OpenGL too. Lazarus includes a TOpenGLControl - a LCL control with an OpenGL context. The lazarus package LazOpenGLContext can be found lazarus/components/opengl/lazopenglcontext.lpk. An example can be found in lazarus/examples/openglcontrol/openglcontrol_demo.lpi. When should you use GLUT, when LCL? GLUT is better if you want to draw everything yourself. LCL is better for normal applications. For example a 3D editor needs a few OpenGL windows and the rest is a normal application using normal buttons, comboboxes, windows, modal windows, etc. The OpenGL part is pretty much the same. GLUT needs a dll under windows, where LCL typically runs out of the box, but a LCL executable is bigger. 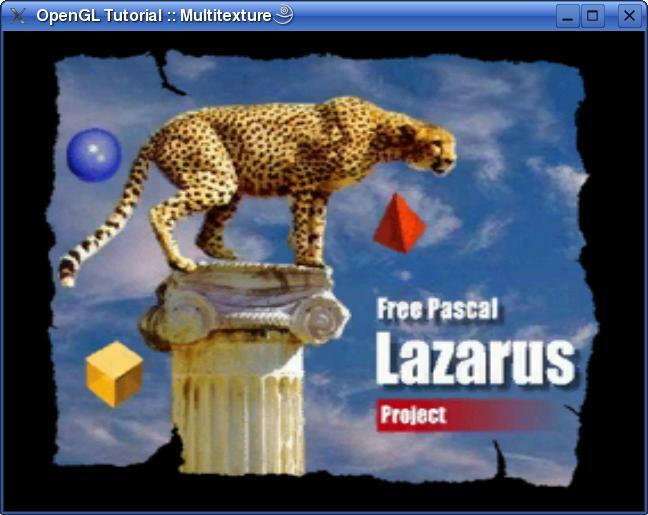 Using LCL is typically the easiest way to access OpenGL with Lazarus. Since GLUT is deprecated, using the LCL is generally a good idea for a new OpenGL Lazarus project. Most of the code samples described below for GLUT are easy to translate into the LCL code, though you will have to find equivalents for the functions with the 'glut' prefix, for example instead of "glutSwapBuffers" we will use the LCL's "SwapBuffers" property to display our rendering. The one great feature that GLUT provides that is hard to do with the LCL is showing text on the screen (see GLUT's "Bitmap Fonts" section below). However, since this is your first LCL program, we will keep it simple by not showing any text. Lazarus comes with a example OpenGL program, you can find it in the folder Lazarus/Examples/openglcontrol. That example demonstrates many powerful features for creating an animated OpenGL image. However, it is also a relatively complicated program. Below is a minimal Lazarus project that mimics some of the features described in the GLUT samples described below. To create this, launch Lazarus and choose Project/NewProject to create a new application. Choose the Project/ProjectInspector menu item, click the 'Add..' button, go to the 'New Requirement' and and the "LazOpenGLContext" package. Next, paste the code below into your 'unit1.pas'. Then, click on your form and in the events tab of the object inspector link the "OnCreate" event to the function "FormCreate". You should now be able to run your new application by choosing the Run/Run menu item. The code creates a new OpenGL panel that fills the form. 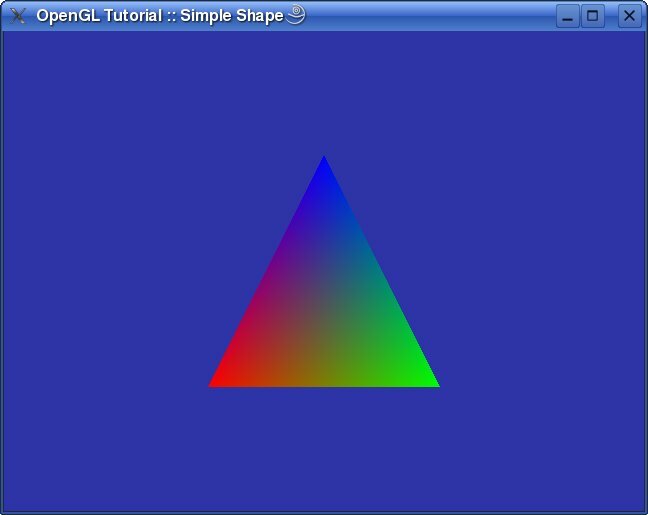 OpenGL draws a simple triangle in the form. Note that when you run the application you can resize the form and the triangle rescales proportionally to fill the form. GLBox.OnPaint            := @GLboxPaint; // for "mode delphi" this would be "GLBox.OnPaint := GLboxPaint"
In order to use GLUT, you must first include unit glut and then initialize it. This is done using glutInit function. This function can parse the command line and set parameters for the main window, but it expects input in C/C++ style. You'll have to write your own function to make the conversion from ParamCount and ParamStr to C/C++ like command line parameters. In essence, you create an array and fill it with strings from ParamStr. This function also takes a parameter that can control what is passed to glutInit -- either the whole command line or just the executable file name. ToDo: probably glutInit(@argc, @argv); is enough. Next, you need to create a main window. Set the display mode for the main window using glutInitDisplayMode. It only takes one parameter which is a combination of flags. Usually GLUT_DOUBLE or GLUT_RGB or GLUT_DEPTH is all you will need. The position and size of the window is controlled using glutInitWindowPosition and glutInitWindowSize. They take 2 parameters. X and Y coordinates in the former, and width and height in the latter. You can use glutGet to find the screen size and center the window. Finally, the window should be created using the glutCreateWindow function. It will create the window and set its caption through a parameter. As a result it will return the window's handle. This can be used with other functions that require it. Before your program can enter the main loop, you must set some callbacks. You will a need callback for drawing the window, for resizing and for getting keyboard input. These callbacks are set using glutDisplayFunc, glutReshapeFunc and glutKeyboardFunc. This will only clear the window to the background color and reset the zbuffer (don't worry about zbuffer... more about that later). With this code, you tell OpenGL where in the window it should draw and set matrices to the desired values (matrix functions will be explained later). This function will instruct your program to exit if you press ESC key. GLUT is event driven and the only way to terminate your program is to call Halt inside one of your callback functions. If you close the window in some other way, it will disappear, but the program will continue to loop through the main routine indefinitely. To start the main loop, call glutMainLoop. It will enter a loop that never ends, which calls all your callback functions. The next tutorial will add some code that will draw a simple shape. Download source code or a linux/windows executable from Lazarus CCR SourceForge. Note: The following parts are almost only OpenGL, so they run under GLUT and LCL. You can recognize GLUT specific functions with the prefix 'glu'. This time we shall add just a few lines of code and focus on explanation of some of the OpenGL functions. Let us explain code you already have. Using glMatrixMode function you chose which matrix you want to change. OpenGL works with 3 matrices: GL_MODELVIEW: this one is used to move vertex to model space. GL_PROJECTION: this one is used to convert 3d coordinate to 2d coordinate for finall pixel position. GL_TEXTURE: this one is used to alter texture coordinates. Once you chose matrix you want to change, you can call functions that affect matrix values. glLoadIdentity will reset matrix so it doesn't affect vertex position. Since almost all matrix functions multiply current matrix with a generated one, you sometimes need to clear matrix with this function. In order to set perspective matrix, you can use gluPerspective function. Four parameters present the field of view, aspect ratio, near and far plane. It's that simple. Now, you'll change model matrix... for this time, you just set it to identity. We have allready used glClear function. It will just reset buffers. We'll skip next two functions and head for drawing ones. glBegin marks beginning of drawing block. After this function you can start entering vertices. Parameter describes how are vertices used when drawing: GL_POINTS: Treats each vertex as a single point. Vertex n defines point n. N points are drawn. GL_LINES: Treats each pair of vertices as an independent line segment. Vertices 2n-1 and 2n define line n. n/2 lines are drawn. GL_LINE_STRIP: Draws a connected group of line segments from the first vertex to the last. n-1 lines are drawn. GL_LINE_LOOP: Draws a connected group of line segments from the first vertex to the last, then back to the first. Vertices n and n+1 define line n. The last line, however, is defined by vertices n and 1. n lines are drawn. GL_TRIANGLES: Treats each triplet of vertices as an independent triangle. Vertices 3n-2, 3n-1 and 3n define triangle n. n/3 triangles are drawn. GL_TRIANGLE_STRIP: Draws a connected group of triangles. One triangle is defined for each vertex presented after the first two vertices. For odd n, vertices n, n+1 and n+2 define triangle n. For even n, vertices n+1, n and n+2 define triangle n. n-2 triangles are drawn. GL_TRIANGLE_FAN: Draws a connected group of triangles. One triangle is defined for each vertex presented after the first two vertices. Vertices 1. n+1 and n+2 define triangle n. n-2 triangles are drawn. GL_QUADS: Treats each group of four vertices as an independent quadrilateral. Vertices 4n-3, 4n-2, 4n-1 and 4n define quadrilateral n. n/4 quadrilaterals are drawn. GL_QUAD_STRIP: Draws a connected group of quadrilaterals. One quadrilateral is defined for each pair of vertices presented after the first pair. Vertices 2n-1, 2n, 2n+2 and 2n+1 define quadrilateral n. n/2-1 quadrilaterals are drawn. Note that the order in which vertices are used to construct a quadrilateral from strip data is different from that used with independent data. GL_POLYGON: Draws a single, convex polygon. Vertices 1 through n define this polygon. 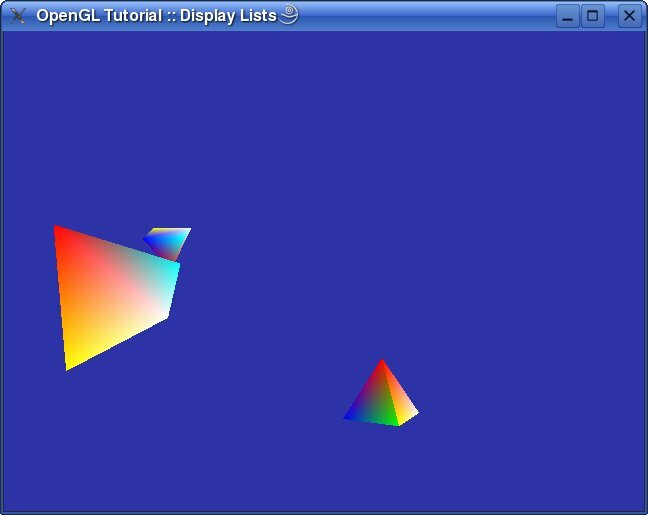 You'll draw single triangle and for that GL_TRIANGLES flag will do the trick. glVertex3f function defines the position of a vertex you want to draw. There are more glVertex* functions. Only difference is number and type of parameters they take. For instance... glVertex2i takes two parameters (x and y) of integer type. glVertex3f will almost always be just what you need. Before glVertex you can set color, material, texture... For simplicity you'll just specify color for each vertex in this tutorial. Color is set using glColor3f function. 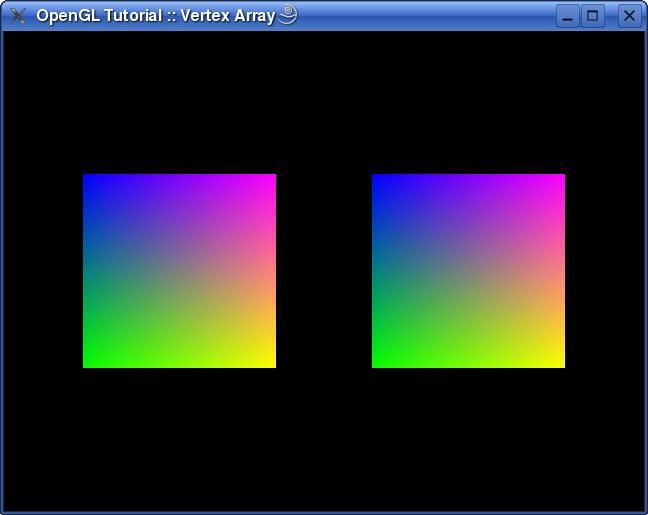 glColor can also take different set of parameters like glVertex. As we look through code we can see that Z is set to 0 for all vertices. Since you set near plane to 0.1, triangle will not be visible. That is where those two functions we skipped in the beginning jump in. We already know that glLoadIdentity reset matrix. glTranslatef moves triangles by X, Y and Z values you provide. Since you set Z to -5 (negative Z is farther from camera) all vertices will be drawn 5 units far from point of view and will be visible. In the end you call glEnd functions that finishes drawing. You could now start another drawing block with new glBegin function if you wish. Download source code, linux executable or windows executable from Lazarus CCR SourceForge. Sometimes you'll need to draw some object multiple times on scene. OpenGL has ability to build display lists which make drawing a bit faster. Creating display list is very easy... just draw vertices as you did in previous tutorial and enclose them with glNewList and glEndList calls. glNewList creates new display list and all drawing functions will be recorded until glEndList is called. The first parameter for glNewList function is list ID. Every list is defined by it's ID. If list with given ID is already created it fill be cleared before recording. If the second parameter is GL_COMPILE then all drawing functions are just recorded, but if it is GL_COMPILE_AND_EXECUTE then they are recorded and executed automatically. Using glCallList you can draw only one display list. In this tutorial, before drawing display list, you change model matrix and draw object in different places. GL_BYTE: list is treated as an array of signed bytes, each in the range -128 through 127. GL_UNSIGNED_BYTE: list is treated as an array of unsigned bytes, each in the range 0 through 255. GL_SHORT: list is treated as an array of signed two-byte integers, each in the range -32768 through 32767. GL_UNSIGNED_SHORT: list is treated as an array of unsigned two-byte integers, each in the range 0 through 65535. GL_INT: lists is treated as an array of signed four-byte integers. GL_UNSIGNED_INT: list is treated as an array of unsigned four-byte integers. GL_FLOAT: list is treated as an array of four-byte floating-point values. GL_2_BYTES: list is treated as an array of unsigned bytes. Each pair of bytes specifies a single display list ID. The value of the pair is computed as 256 times the unsigned value of the first byte plus the unsigned value of the second byte. GL_3_BYTES: list is treated as an array of unsigned bytes. Each triplet of bytes specifies a single display list ID. The value of the triplet is computed as 65536 times the unsigned value of the first byte, plus 256 times the unsigned value of the second byte, plus the unsigned value of the third byte. GL_4_BYTES: list is treated as an array of unsigned bytes. Each quadruplet of bytes specifies a single display list ID. The value of the quadruplet is computed as 16777216 times the unsigned value of the first byte, plus 65536 times the unsigned value of the second byte, plus 256 times the unsigned value of the third byte, plus the unsigned value of the fourth byte. That is for now. 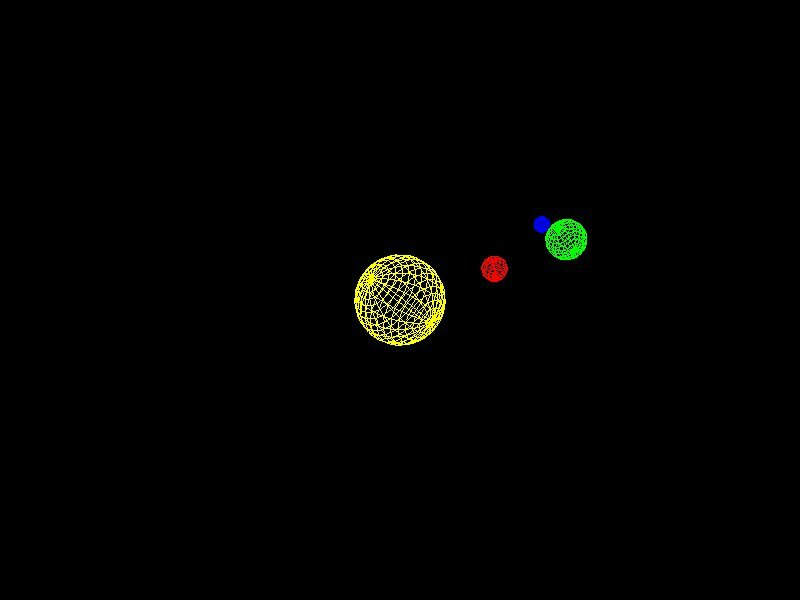 Next tutorial will show how to create little planetary system. We'll talk about matrices and how to make animated scene that doesn't depend of number of frames per second. In FSMode string we declared that full screen mode should be 800x600, with 32bit pallete and 75Hz refresh. It is possible to skip one of the group. If you omit size, GLUT will try to use current one or first smaller that can work. That policy is used and for other parameters. glutIdleFunc defines callback function that you want to be called every time you program has no messages to process. Since we just want to render new frame if there is nothing to do, just set idle function to DrawGLScene. Some other tutorials show that idle function should send refresh message insted of drawing, but that way I have 50-100 frames less than using method I described. As you can see, all you need to do is to call glutLeaveGameMode. gluLookAt create matrix that will define from where are you look to objects. First 3 parameters are X, Y and Z coordinate of position of camera. Next 3 parameters are X, Y and Z coordinate of point where camera look at, and last 3 parameters defines "up" vector (where is "up" for the camera). Usually, up is positive y axis. glPushMatrix i glPopMatrix are used to save and restore matrix state. As you can see, we save matrix state, then change matrix in order to draw object in right place, and then restore old matrix state. You may wonder what is T variable for. Well, it is used to determen animation speed. Every change that depends on time is multiplied with T. That way animation speed is constant on every frame rate. glutGet function with GLUT_ELAPSED_TIME parameter returns time in milliseconds from glutInit is called. By dividing that value with 1000, we get time in seconds. glRotatef function create rotation matrix. First parameter is angle in degrees, and last 3 parameters defines axis around which rotation will be done. Since you multiplied angle with T, object will be rotated by that angle in exactly 1 second. This tutorial will introduce some light to the scene. You'll make rotating cube and one light which will add some realism to the scene, but first let's make some utility unit. For now it will have only basic functions to help us getting current and delta (time that elapsed from one render to other render call) times and for calculating frames per second. As you can see, there is nothing complicated in this unit. Time is simply saved betwen calls and difference is returned. FrameRendered should be called every time you draw scene so function can calculate FPS. Now, let's have fun with lights. OpenGL have several types of light... ambient, diffuse, point, spot, specular and emissive light. Ambient light is something like Sun. When sun rays pass through the window of a room they hit the walls and are reflected and scattered into all different directions which averagely brightens up the whole room. All vertices are lit with ambient light. Diffuse light can be represented as parallel light rays comming from far away. They will lit only vertices that are oriented towards the light source. Point light lights all around it. It is like a fire ball, it send light rays all around it and lights vertices that are oriented towards light source and that are close enough. Spot light is like light from flashlight. It is simply a point light source with a small light cone radius. All vertices that falls inside of cone and are close enough are lit. Just like Diffuse light, Specular light is a directional type of light. It comes from one particular direction. The difference between the two is that specular light reflects off the surface in a sharp and uniform way. The rendering of specular light relies on the angle between the viewer and the light source. From the viewer’s standpoint specular light creates a highlighted area on the surface of the viewed object known as specular highlight or specular reflection. Emissive light is a little different than any other previously explained light components. This light comes out of object you draw but don't lit other objects in nearby. As you see, we enable lighting in OpenGL so lights affect scene you are rendering. Light parameters are set with glLightfv function. It takes 3 parameters... one for light number you want to change (OpenGL suports up to 8 lights), next tells OpenGL what light parameter to change, and the last one is new parameter for light. You'll set just diffuse color for light in this tutorial. After that, you can enable light and there will be light in the scene... but... that is not all. You expected something more complicated, do you? :) Well, this code allows us to use glColor function to set material to vertices. By using glEnable function and GL_COLOR_MATERIAL flag, you can define what material properties will glColor change. glColorMaterial(GL_FRONT, GL_AMBIENT_AND_DIFFUSE) tells OpenGL that glColor changes ambient and diffuse material. We'll discus materials more in later tutorials. One more thing that is important when using lights... every vertex must have normal associated with it. Normal is used to find the direction of vertex so light can be calculated properly. You'll use GLUT function to draw cube and it provides normals for us, so this time we'll just walk by normals. Games and programs usually need to write some text on screen. GLUT provides several functions for drawing chars that are platform independent. First, we'll show how to use default bitmap fonts. Almost all code additions will be made to utils.pas unit. We just get left/right, top/bottom and calculate width/height by subtracting them. When entering 2D mode, we save current matrices and set 2D matrix using gluOrtho2D function. This way if we draw some thing on 100, 100 it will be drawn on exactly 100 pixels from left edge of window, and 100 pixels form bottom edge (positive Y is up). Also, we disable ZBuffer. This way text won't alter ZBuffer. Leaving 2D mode just returns old matrices and enable ZBuffer. glutBitmapCharacter can draw only one character of selected font. First parameter is desired font (GLUT_BITMAP_9_BY_15, GLUT_BITMAP_8_BY_13, GLUT_BITMAP_TIMES_ROMAN_10, GLUT_BITMAP_TIMES_ROMAN_24, GLUT_BITMAP_HELVETICA_10, GLUT_BITMAP_HELVETICA_12 or GLUT_BITMAP_HELVETICA_18) and other one is character. Character will be drawn at current raster position. To set desired raster position we call glRasterPos function. glRasterPos can handle different number and types of parameters just like glVertex function. Coordinate specified is transformed by model and projection matrix to get 2D coordinate where new raster position will be. Since we entered 2D mode, X and Y coordinates are actual 2D coordinates where drawing will occur. 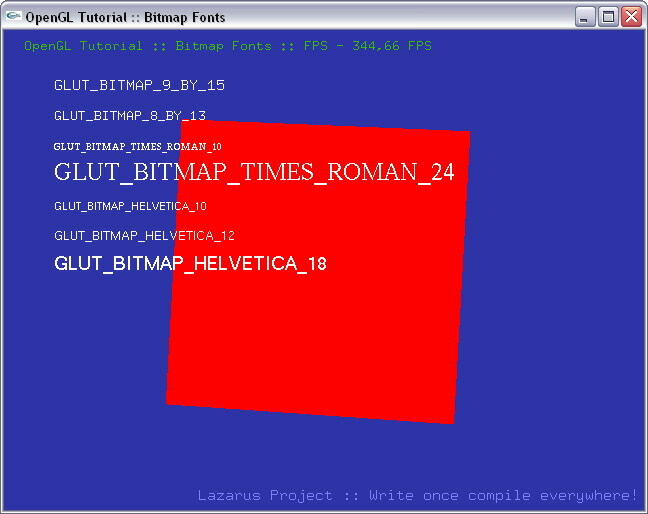 We draw red cube and rotate it, and some text to show how various bitmap fonts look like. glutBitmapLength function is used to find width of string so it could be aligned to right. Code can easily be altered to center text. Note: See how cube looks without light. This tutorial will show how to draw textured polygons and how to blend textures using multipass technic. Since OpenGL has no builtin mechanism for loading textures, we'll use external library: Vampyre Imaging Library. We'll use just OpenGL helper functions, but you may find this lib handy for some other things to. Notice glTexCoord functions. They are used to specify which part of texture is assigned to vertex. Coordinates defined in this functions are from 0 to 1 (values greater than 1 are allowed but can generate different results). 0 is first pixel and 1 is last pixel. So, 0.5 will be right in the middle of texture. LoadGLTextureFromFile loads texture from file and returns it's ID. When texture is loaded it is allready setup for rendering. Last line just enables 2D textures. Next time, we'll use extensions to show how to use singlepass multitexturing. When youknow multipass multi texturing, singlepass is very easy. Texturing is separated in stages. First stage setup and draw first texture, second stage draws another one and so on. All you have to do is to setup texture stages and to render object. First we need load OpenGL extension that will allow us to use multitexture functions. Load_GL_ARB_multitexture will try to load those extensions and will return TRUE if operation was successful. 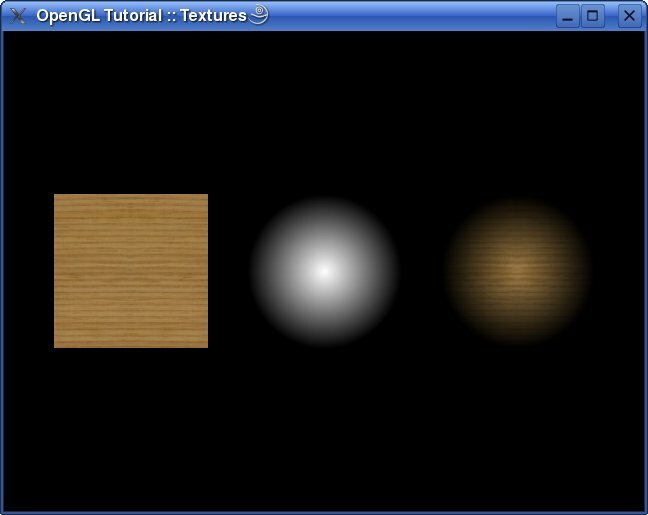 To select texture stage you want to work on, use glActiveTextureARB function. It takes only one parameter that define which stage you want. After that all texture functions (enabling, disabling, binding, creating...) will affect that stage. As you can see, difference is only in defining texture coordinations. We now use glMultiTexCoord2fARB function that takes texture stage and texture coordinations. Every thing else is unchanged. Today almost all graphic cards supports at least 2 texture stages. Using singlepass multitexturing is faster than multipass version since you draw objects only once. If hardware supports singlepass multitexturing (Load_GL_ARB_multitexture returns TRUE) use it. This one will be short. OpenGL can capture current scene to texture so you can use it for texturing other objects (TV screen, mirror or some thing else). Well just render scene to texture and apply it to rotating plane. Buffer for 256*256 RGB image is created and it is used to setup 2D texture. First, everything is setup for scene that will be captured. Viewport is reduced to 256*256 so it will fit into texture and scene is drawn. glCopyTexImage2D is used to capture scene to currently selected texture. When we have scene captured to texture, everything can be cleared again, viewport can be returned to original size and final scene is drawn using previous scene as texture. P.S. Captured texture can be saved using SaveGLTextureToFile function from Vampyre Imaging Library. 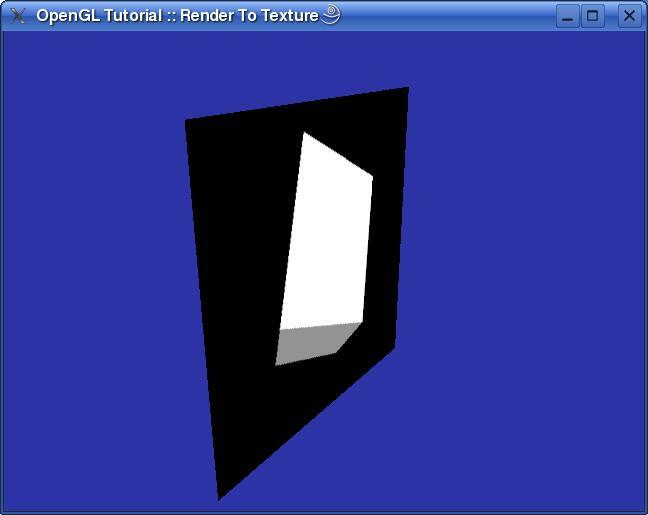 OpenGL is capable of rendering primitives using data that is stored in buffers insted of calling glVertex. Buffers can be used to define vertex and texture coordinates, and colors (index and RGBA), normals and edge flags. In this tutorial well use only vertex and color buffers, and we'll show non-indexed and indexed drawing. Non-indexed mode draws buffers as streams. Indexed mode will draw buffer elements in order that is defined in index buffer. But enough talking... let's start coding. We have two buffers. One for vertex coordinates and one for vertex colors. This 6 vertices defines 2 triangles that forms rectangle. Last parameter if pointer to the begginig of buffer. When buffers are selected we can draw them using glDrawArrays functions. All enabled buffers are used to draw primitives. What kind of polygons are being generated is defined in first parameter (same as in glBegin function). Next two defines subset of buffer which is used for drawing (start and count). When buffers are not needed you can disable them. FVertices will contain data about vertices, FColors data about color and FIndices data about indices when external file is loaded. This means that there is 3 vertices and 3 indices defined in file. First vrtex is at -1, -1, 0 and has color 1, 1, 1 and so on. Indices defines that order in which vertices are drawn (in this case vertices are drawn in the same order as they are defined). As you can see, allmost everything is the same as for non-indexed drawing, except function that actually draw polygons. In this case we use glDrawElements function. For this one we specify what kind of polygons we want, how many indices are in index buffer, type of data in index buffer and pointer to the beginning of index buffer. As you can see, there is data for only 4 vertices and 6 indices. So, first triangle is defined by vertices 0, 1 and 2, and the seccond one by vertices 0, 2 and 3. By using indexed mode we don't have to duplicate vertices. A great feature of Lazarus is "write once, compile anywhere", where code should just work on MacOS, Linux or Windows. However, to support all three of these systems you need to decide whether to only support legacy OpenGL or to use the leander "OpenGL Core" profile. For Linux and Windows users, recent versions of OpenGL are a superset of older versions. Therefore, a Linux user can mix and match old OpenGL code with modern shaders. This is not the case for Macintosh MacOS (nee OSX) users. MacOS provides two forms of support: the legacy mode supports all OpenGL features up to 2.1 (and GLSL 1.2). Alternatively, the user can select a modern core version of OpenGL (whereas most Linux and Windows users have access to the compatibility versions of OpenGL). The core versions of OpenGL remove many deprecated legacy functions. This means that all the tutorials above will only compile in MacOS's legacy mode. The core mode has no fixed function pipeline and therefore the developer must write their own shaders. In addition, the Core mode removes some basic primitives like GL_QUADS, so a quad needs to be replaced by two triangles (this actually makes sense: all vertices of a triangle are coplanar, but this is not necessarily the case for a quad, just like each leg of a 3-legged stool will always touch the ground, while a 4-legged stool might wobble if one leg is shorter than the others). The benefit of the core model is that it is lean, and generally easy to adapt to mobile devices (which use a similar, embedded form of OpenGL). See Apple's website to see the OpenGL supported by your operating system. A further wrinkle is that the Core modes of OpenGL are only supported on the Cocoa widgetset, so you can not use the Carbon widgetset (which is currently the Lazarus default). Three demo projects are available on Github, and will compile using Lazarus 1.6.2 or later on Linux, Windows or MacOS. 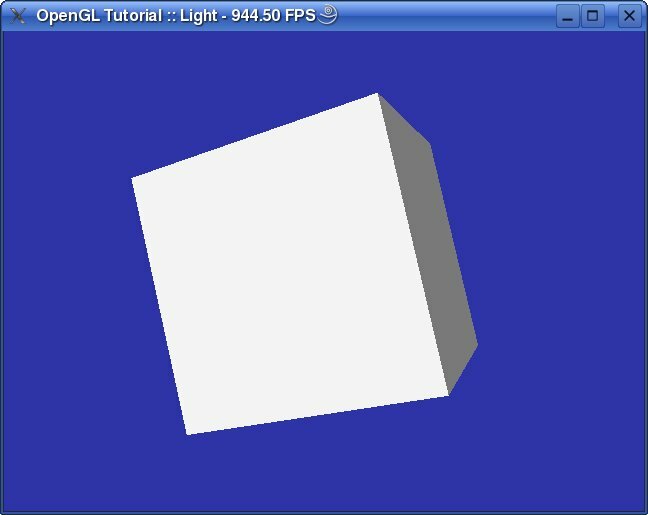 OpenGL Light Tutorial - An OpenGL tutorial outlining how to create and manipulate lights, as well as deal with polygon surface reflections using normals. This page was last modified on 8 January 2019, at 17:34. This page has been accessed 108,117 times.